Increasingly today, people opt to take health supplements such as fish oil capsules, multivitamins and Vitamin C tablets as a lifestyle choice. People think that by taking such supplements they are helping boost their immune system, or ensuring a balanced diet or even covering for a known deficiency. 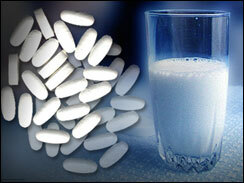 However, one should keep in mind that taking too much supplements can overload the kidneys and liver. In the end, nothing truly beats a healthy and balanced diet with natural elements of everything from fibre and minerals to protein and vitamins. With that in mind, here is a list of the 8 most popular health supplements that people are taking. A tablet typically contains a cocktail of vitamins and minerals, including vitamin C, calcium and folic acid. Multivitamins provide some insurance against deficiencies. This water-slouble vitamin, also called ascorbic acid, helps repair body tissues. A deficiency in this vitamin can cause a person to bruise easily and dampen his ability to fight infection. This mineral is needed to form bones and teeth, as well as for blood clotting and the transmission of signals to nerve cells. Its role in preventing osteoporosis, or brittle bones, however is probably the most well-known. A dietary supplement generally made from amino sugar extracted from shellfish tissue, it relieves pain and inflammation in the joints. Otherwise known as Omega-3 fatty acids, they are harvested from fish. Benefits are believed to include improved cardiovascular health and brain function. Made from chicken extracts spray-dried into powder and then packaged into pills, it is believed to restore mental and physical energy. A herbal remedy that comes in the form of capsules, extracts and tea. It is believed to boost the immune system. Vitamin B Complex:A tablet typically contains the essential B vitamins and is believed to be an energy booster. It also builds a healthy nervous system and improves digestion. But is is most famously known as a "stress-buster". These health supplements are all useful in making sure that your body intakes enough vitamins and minerals. Nice to know that some online pharmacies sell them for much cheaper prices. I also use some of these supplements to have a healthier body. I used to be prone to sickness, but now I am much stronger and physically fit. I think vitamin supplements very essential for human.